AT CABATUAN AIRFIELD, BARRIO TIRING, CABATUAN, ILOILO? At left of photo, Lt. Col. Ryoichi Tozuka. At right of photo, Col. Raymond Stanton. One of the personalities prominently appearing on the photographs of the Japanese surrender signing ceremony at Cabatuan Airfield, Barrio Tiring, Cabatuan, Iloilo, Panay Island, Philippines, on September 2, 1945, was the Japanese-American translator. According to the MIS (Military Intelligence Service) website, the translator assigned in Panay in 1945 was Moffet Mitsuo Ishikawa. "March 1945 - U.S. forces retake Manila and Corregidor in the Philippines where MIS linguist Harry Akune parachutes into battle. Other MISers were Norman Kikuta, Milton Tanizawa and Tom Kadomoto. Shizuo Tanakatsubo participates in Mindoro and Moffet Ishikawa serves in Panay, Philippines." An online article about Sgt. Moffet Ishikawa by Ralph Pearce published on April 27, 2016 at the San Jose Public Library (SJPL.org) website also states that Moffet Ishikawa was with the Military Intelligence Service as translator. "During WWII, Moffet served in the U.S. Army�s Military Intelligence Service, and interrogated Japanese prisoners. Following the war, he spent time in occupied Korea. After having served for four years, he received word that he could finally return home. After being discharged at Camp Beale near Marysville, Moffet began his journey home. He hitched a ride to Oakland, and then took the train to San Jose." So, was Sgt. Moffet Ishikawa the one appearing on the Cabatuan photos? Ralph Pearce (the author of the online article about Moffet Ishikawa) and the family of Sgt. Moffet Ishikawa don't think so. An additional World War II photo of Moffet provided by Ralph to this writer confirmed that it's not him. So who was the Japanese-American translator appearing on the Cabatuan photos? If it's not Moffet, then the MIS website must be incomplete and there must be other translators there assigned in Panay. According to the April 1987 Philippine Philatelic News, there were 7 Japanese-American translators assigned with the 40th Infantry Division at about that time. "The language team of the 40th Division was headed by Lt. Richard Child, with Terno Odow as its leader, and the Nisei translators were Kay Futamase, Mike Hori, Moffet Ishikawa, Hisashi Komori, Kay Tamada, Shizuo Tanaka and Shogo Yamaguchi." At the surrender signing ceremony in Cabatuan Airfield, Lt. Colonel Ryoichi Tozuka signed for the Japanese Imperial Army. Tozuka was the commanding officer of the 170th Independent Infantry Battalion and the overall Japanese commander in Panay Island. Receiving the surrender was Colonel Raymond Stanton, commanding officer of the 160th Infantry Regiment. Also present at the ceremony were Brig. General Donald Myers, commanding the U.S. Army's 40th Infantry Division; Rear Admiral Ralph Davis, commanding the U.S Navy's 13th Amphibious Group; Capt. Bob Matthews (U.S. Navy), commanding USS Estes; and other officers of the U.S. Army and the U.S. Navy. 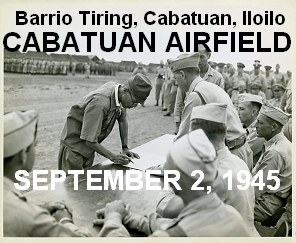 The Japanese forces operated Cabatuan Airfield from the time they arrived in Panay in April 1942, until they retreated to the mountains in March 1945.